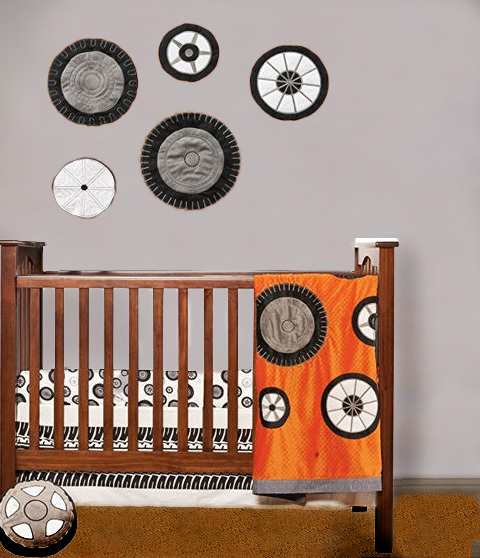 We have decorating ideas for NASCAR nursery themes for baby's room that features everything from your favorite driver to checkered flags with decorations and gear with baby bedding recommendations that racing fans will adore! The selection in crib bedding and decor for this theme has been thin in but lately a cute set has surfaced in a black and white checkered flag pattern that is simple but flexible. The good news is that the monochromatic color scheme will work well with a wide variety of colors. In fact, the colors of your favorite race car is an excellent source for ideas for decorating a baby's NASCAR theme nursery. Plus, pictures of your favorite driver's race car are excellent wall decorations and are very kind to your budget especially if you are the photographer. It doesn't matter if you stake a claim on a spot for the races for some fun Talladega days and nights or if you are just tickled pink sitting in your easy chair watching the cars going round and round in circles on the tracks via television. Go here to see more race car baby bedding and nursery decor for your project. Many fans are so dedicated that they can dream of little else but a NASCAR nursery theme design for their baby boy or girl. There are some affordable race car print comforters that you can adapt to serve as NASCAR crib bedding sets in most Nascar nursery themes until they come out with the official Nascar bedding line. This NASCAR site tells ALL! Decorate the nursery walls with Nascar pictures and quality art prints, some racing or race car wallies or a corkboard where you can leave reminders to tune into the next race or keep up with racing stats! Wallpaper murals depicting the Daytona Raceway are for sale that will take care of an entire wall! No artwork necessary. Plaid wallpaper or a checked border would be a lovely background. For a challenging nursery painting technique paint your own checkerboard decorations. Give it a try! You'll be amazed at the effects you can get with some masking tape and a little patience. Your race car color scheme will depend on what NASCAR crib bedding set you use. If you go with the high contrast black and white checkered flag look you can be flexible with your colors that you paint the wall. If you decide on a solid color set of NASCAR crib bedding, pop a few lines on the wall and use a checkerboard painting technique on an accent wall. Checkered flag racing curtains or valances can be stitched up right at home and you can make an affordable set of Nascar crib bedding as well! Often the window treatments that match baby's nursery crib sets don't fit your windows. If this is the case, don't despair. It's simple to make gathered valances that will work just fine. Black and white checks or even a race car fabric may be just the trick. Go to your local fabric store and take a look. You will get loads of unique nursery decorating ideas from looking at the design of the prints. Please visit Unique Baby Gear Ideas again soon to see the latest race car theme nursery decorating ideas.